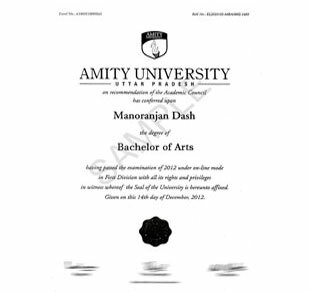 As a participant of the Bachelor of Arts tuition free online program from AMITY University you will experience the knowledge as well as a degree from India's No 1 private and UGC recognized University. This program will help you to develop knowledge and skills required in any organization such as innovative thinking ,creative writing, an understanding of society, humanities, and language. This online program will impart academic orientation towards research, innovative thinking and writing, while you undertake specialist subjects tailored to your specific career path.